The Notre Dame Cathedral was undergoing a massive renovation project, including work on its iconic spire that could be ‘potentially linked’ to the blaze. As firefighters continue the battle to save the 800-year-old Notre Dame Cathedral, the Paris fire brigade has said that the fire is ‘potentially linked’ to the €6 million (about CAD$9 million) renovation on the church’s iconic spire and its 250 tons of lead. 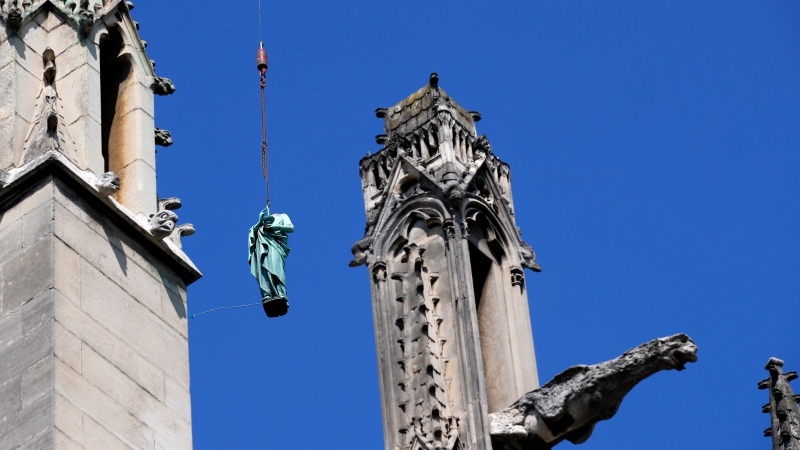 Last week, the apostle statues that surrounded the spire were removed to be sent to the southwest of France for repairs, as part of the major overhaul planned for the landmark by the French state, the Catholic Church and charity groups. The Friends of Notre-Dame de Paris foundation was incorporated in 2016 to assist the French state and the Church in raising the millions of Euros needed to fund the extensive renovations. According to their page on the Notre Dame Cathedral's website, the most obvious repairs were needed to the spire and 12 apostle statues, aging stonework threatening the stability of the whole building, decorative stonework (such as pinnacles and gargoyles) in disrepair, and extensive water damage that had accrued over the decades. The spire collapsed in Monday’s blaze, but firefighters were hopeful that they could save Notre Dame’s two front-facing towers. The façade of the cathedral was scrubbed down over a decade ending in the 2000s, and over the years stained glass windows and bells have been replaced, but the true extent of the structural damage has only been made clear in recent years – with references to the building’s impressive history of damage and repair that have contributed to its current state. The cathedral received the first of its major overhauls in the 19th century, when architects redid the iconic spire and added the flying buttresses, partially in response to neglect and damage caused by French revolutionaries. The Ministry of Culture summarized the needed repairs in a 2014 audit and estimated the cost to be €150 million, with the French state funding €2 million annually in upkeep.